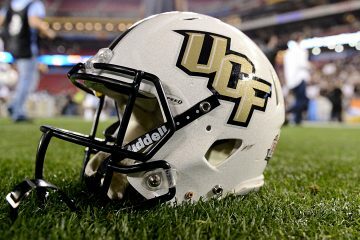 The UCF Knights’ faced another trial by combat Tuesday. On the line: Their legitimacy as a college football powerhouse. When the clock hit zero in State Farm Stadium, the Knights fell short to the LSU Tigers, 40-32. Whether the world at large sees the Fiesta Bowl loss as a dagger in the back of the Knights’ future College Football Playoff hopes or as even more proof that the team can line up and compete against anyone is yet to be seen. The Josh Heupel-coached team started off the game well enough. After holding the Tigers to a field goal in the opening minutes of the first quarter, the Knights went on a 14-0 run, scoring on a 25-yard run from Greg McCrae followed by a phenomenal 93-yard return by Brandon Moore after Joe Burrow threw his only interception of the game. Other than the pick, Burrow seemed like a NFL prospect, making 21 completions on 34 attempts (62 percent) for 11.6 yards per attempt and nearly 400 yards through the air. The performance was unprecedented for junior quarterback. Heading into the game, he had completed 57 percent of his passes for 7.25 yards per attempt and 12 touch downs across a dozen games. Compared to Burrow, Darriel Mack Jr. looked pedestrian. Of course, the Fiesta Bowl was only the second start of Mack’s college career. Until December he’d played backup to McKenzie Milton, who went down with a knee injury in the Knights’ 38-10 drubbing of in-state rival USF. Knights fans got flashes of Mack’s abilities in the American Athletic Conference championship game against Memphis a month ago. In that game, Mack completed 70 percent of his passes for 348 yards and two scores. He added four more touchdowns on the ground in the 56-41 shootout. That Mack was nowhere to be seen Tuesday. He looked every bit like the freshman he is. He completed just 37 percent of his passes for 96 yards, adding one score and making an INT that sealed the Knights’ loss and, along with it, an end to their 25-game winning streak. Still, the game was not lopsided. As the Knights proved a year ago, they have the talent to hang with major conference powerhouses. Tuesday just wasn’t their day. On Burrow’s back, the Tigers came back from that 14-3 first-quarter deficit to take a 24-21 lead heading into halftime. When play resumed, the SEC West squad tacked on another score via a 32-yard pass from Burrow to Ja’Marr Chase, and another field goal midway through the third to take a 13-point lead. The Knights only wrangled 3 points in the third, but made a valiant effort in the period, capping a 78-yard drive with a 2-yard TD from Taj McGowan and picking up the two-point conversion to make it a one-score game, 40-32, with 2:24 left on the clock. 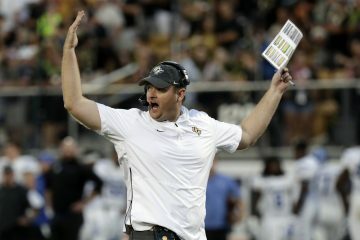 The Knights defense did their job and held the Tigers to a three-and-out on their ensuing possession, giving their offence a chance to win, but their hopes were dashed when Mack threw that lone pick, allowing the Tigers to line up in victory formation and close the books on a 10-win season — their first since 2013. For UCF, it was a sour end to a stellar season. But there’s plenty to look forward to in 2019. 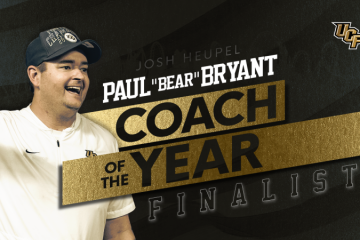 The Knights have their best recruiting class in modern history ready to suit up in the black and gold, and Huepel, unlike the coach he replaced, will offer the team some continuity heading into his second year at the helm.